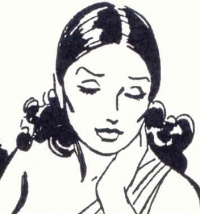 Eleanora is a character from Mandrake comic strip that first appeared in "Mandrake's Family". Eleanora was the only child of a powerful ruling Duke, brother of a King. When she was traveling to her College her chauffeur driven lost and ended up at the College of Magic. She was very excited about it and decided to study College of Magic. At age of 25 she proposed to Theron, he said yes. A year after she told him she was pregnant, but sadly she died during the childbirth. Eleanora, named after Lee Falk's mother. This page was last edited on 5 June 2013, at 09:06.